Circa 2010….Stone Laboratory’s legislative day. I’ve been doing presentations like these for 15 years now! 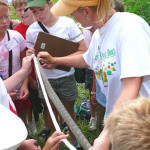 Environmental Adventure Camper’s from Put-in-Bay help measure watersnakes on North Bass Island. Opportunities like this not only provided a hands-on educational experience for these kids, but also added to the data we needed for our research. Dr. Rich King, from Northern Illinois University, is my former graduate advisor and has been the lead scientist working with the LEWS for more than 30 years. If I’m “the island snakelady” then he is the “Godfather of LEWS”! 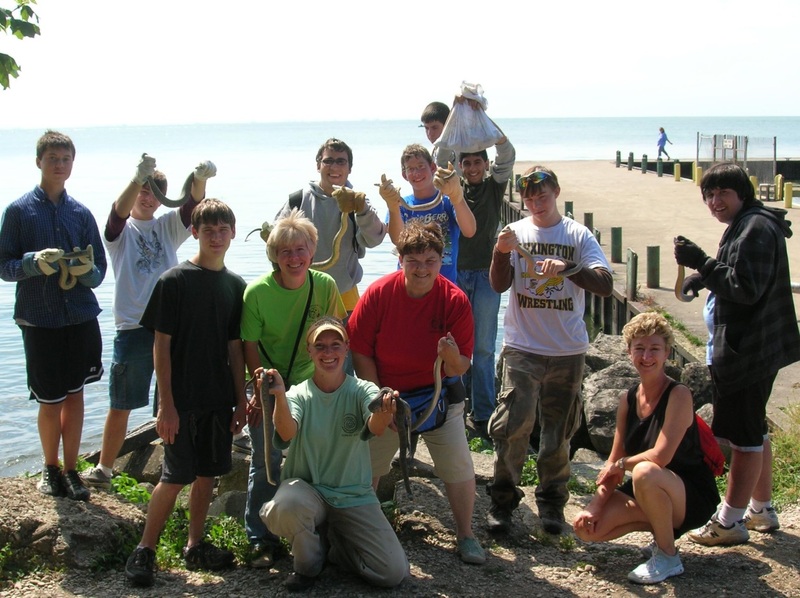 Taking volunteer groups out in the field to do research has been one of the keystones of our education and outreach program. 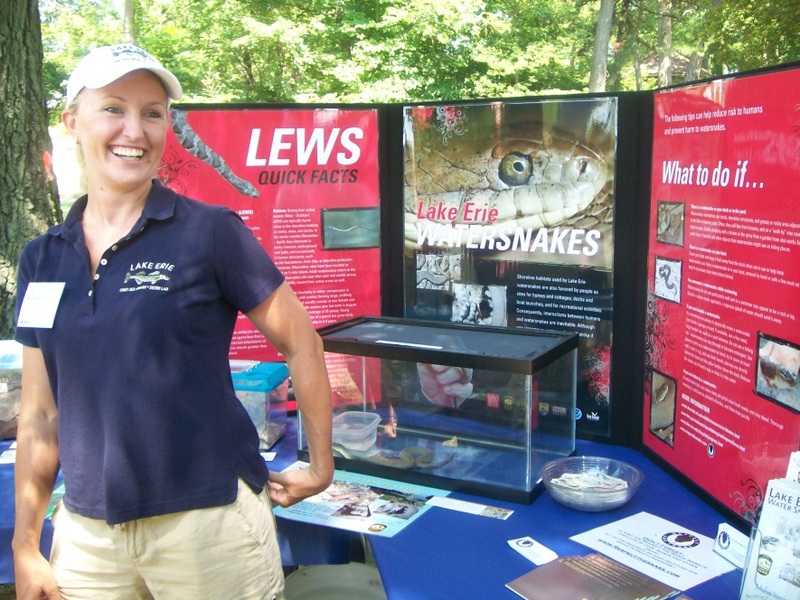 The Ohio Bird Sanctuary Volunteer Naturalist Program (pictured here) has been bringing groups up to assist for more than 10 years now. I was obsessed with Jacques Cousteau as a kid! I never missed one of his specials and used to tell my mom that one day I would be out on a boat with him exploring the ocean world. She’d remind me that he was old and that he would likely be dead by the time I finished school…which wasn’t far from the truth! 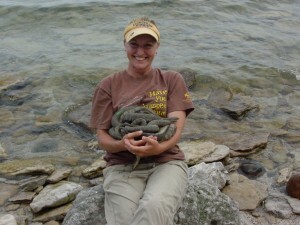 What brought me to the Great Lakes and specifically Lake Erie, was the research program on the Lake Erie watersnake. I came out to the Lake Erie islands in the summer of 2000, planning to stay for about two weeks to help out as a field assistant….. So much for plans! 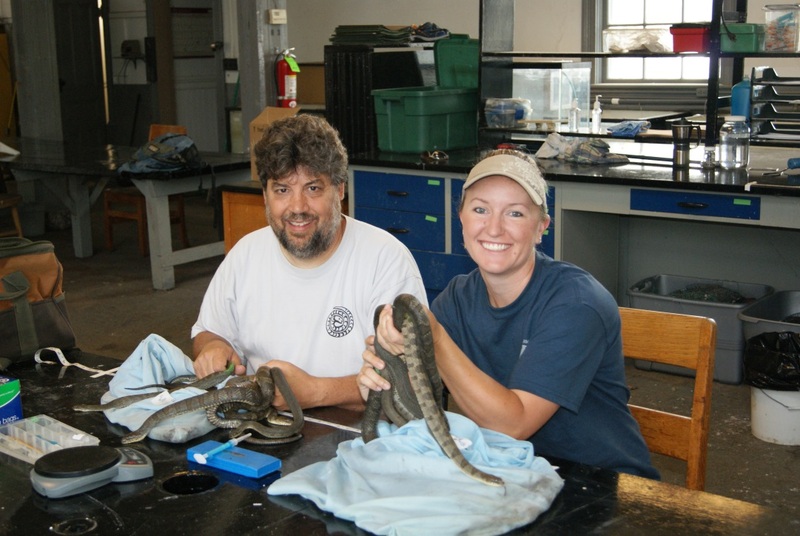 When the lead graduate student dropped out of the project, there was no one but me to do the work and “the island snake lady” was born! The rest is history. I’ve been full time as the Recovery Coordinator for the project since 2003. 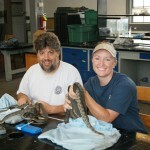 Although I do work with other Great Lakes species of snakes, I primarily work with the Lake Erie watersnake. This is an endemic species to Lake Erie, and is only found within the western basin primarily in the island area. It is endangered in Ontario, CA; threatened in the state of Ohio and was just recently federally delisted in 2011 by the U.S Fish and Wildlife service. 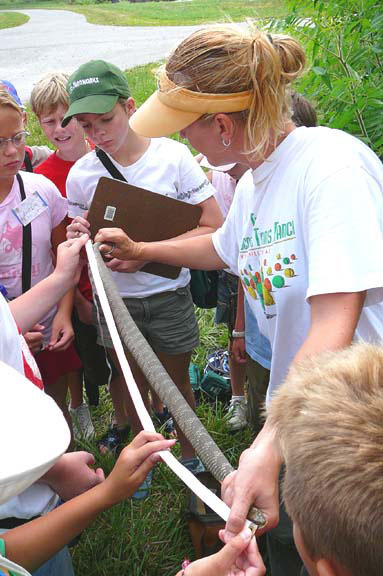 Our conservation program focuses on population monitoring, habitat protection and management and continued education and outreach. 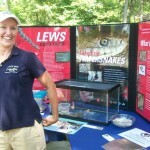 My specific research goals have focused on documenting the effects of the invasive round goby on the snake populations. I have had so many positive community and educator experiences, it’s hard to pick just one. I would say that in general, the thing that I have most enjoyed is working with the local kids in the community and watching how they spread the message for you. I’ve had so many people tell me stories of how they used to kill all the snakes they saw in their yards, until their son/daughter/grandson/etc. came home and told them how they should just let them be….and they did! The message of ‘Respect the Snake’ was something that I didn’t have to force on people…it made sense to the kids, and it made sense to the parents and it worked….amazingly well! Because educators have a passion for sharing what they have learned with others…and that can have resounding long term positive effects far beyond what the scientist might realize. If a scientist stops and takes a few minutes to talk to an educator, and they do it well, that educator will likely talk for years to hundreds of others about what you have taught them. The return on the investment is priceless! Communication! If you can’t figure out how to tell people about what you are doing and why it’s important, then most people will have a difficult time relating to you and your work.